I’m not saying you have to be a Jew to be a defense attorney, don’t misunderstand. What I’m saying is that Jews never question the necessity of constant and regular vigilance and questioning of their government. 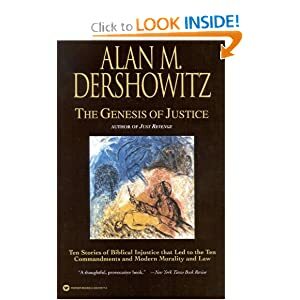 One of the most interesting things I learned from this book is the Jewish interpretation of the command “To do and to believe”. Traditional sources imply that the doing is more important than the believing. Compare this to the Lutheran “Justification by Faith Alone”. Jewish custom stresses the performance of the commandments, over the belief in what they signify. The Lutheran concept stresses the belief in the holy, but discards the necessity to follow the rules. (Of course, this is a simplistic view of a massive dichotomy, but it’s interesting.) Put in legal terms, being Jewish demands you follow the letter of the law even if you disagree with it, being Lutheran means you believe the public policy behind the law is more important than the particular elements you are charged to uphold. It starts to make sense why you have so many Jews who can recite the “Four Questions” from the Haggadah, but self-identify as atheist. I’ve written previously about the Jewish view of the Torah, (or the Old Testament) being seen as a Covenant, or a contract with God. Jews see God wrote it, so when they find a loophole within the Covenant, and God means all things, then God put that loophole in the Covenant. God meant for you to exploit the loopholes in the Torah, because he purposely put those loopholes in there! How does that relate to Jews as lawyers? You have a people who have been trained for Six Thousand years to look for loopholes! Now who do you want as an attorney? And of course, the Holocaust. All of which were run by governments. By people wearing that period of time’s military, or police uniform. The need for healthy suspicion of your government is so ingrained in people raised Jewish, even if not religious, that it is just naturally understood. Yes. Jews put God on Trial. Watch the movie to see the verdict, and maybe more importantly, the sentence. I hate to say “Because when I finally get the innocent client, I don’t want that to be my first case I try for real” because that implies most of my clients are not innocent. And when we go to trial they often are wholly innocent. “He’s not guilty unless I lose.” Is probably my favorite when I’m in a good mood. But underlying the principle is this: All that is necessary for the triumph of evil is that good men do nothing. Because in all of the examples I gave, the Jews being killed were surrounded by good men doing nothing. And no matter the rap, I strongly feel Defense Attorneys are often good men doing something to stop the tyranny of evil. I have no problem if the State wins, fairly and honestly. But my role is to make sure they do it, fairly and honestly. And the more I do it, the more I realize what a necessary, fundamental role that is.